Oh fitness – why aren’t we friends? Around the end of February, feeling really good about myself, I decided to start eating a little healthier (nothing too drastic since vacation was coming up). Of course, vacation and then a week of traveling for weddings totally screwed up my mini lifestyle change, but I didn’t let it get to me. Finally, part of last week and then this week, I was able to make bigger diet changes and incorporate some exercises like squats and push-ups and stuff like that into my daily routine. No big deal, right? Well, today, I decided that it was beautiful outside and that I should really try riding my bike. (I’ve been on like a 2 year break from that. lol) Knowing I’ve made a good decision for myself, I go out to the garage to grab a bike. EVERY adult bike we own (there’s 4) has flat tires. OF COURSE. Do we have an air compressor? Nope. A truck to take the bike to the gas station in? Nope. So, I decided to go to the store and find something to buy to air up my tires. Yay for not giving up! 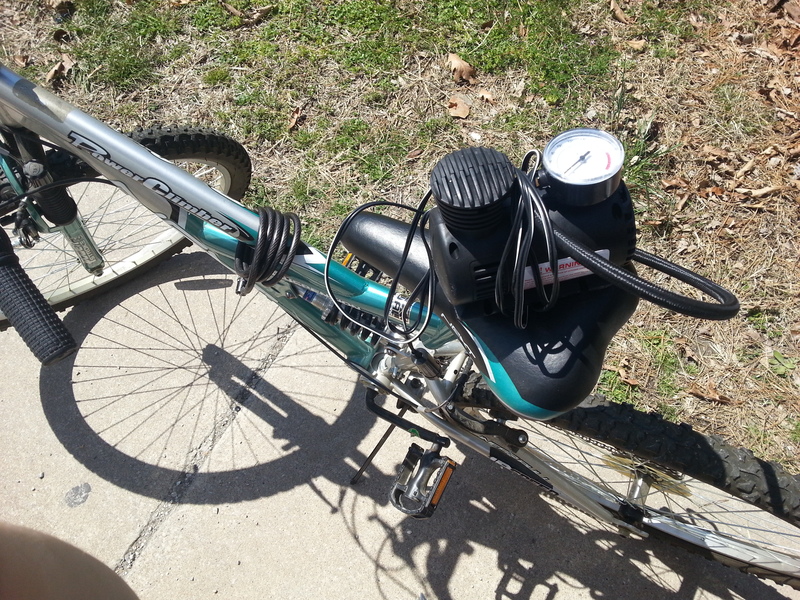 Got the baby compressor, came home, ate lunch, wheeled out a bike and started trying to air up the tires. No luck. 15 minutes later, I had discovered that I was using it wrong. BIG SURPRISE. 😉 Finally got the tires to air up and realized after riding 20 feet that the bike wouldn’t change gears and the front breaks weren’t working. Uhhhh….REALLY?? Take 2: Got ANOTHER bike out , tripped over it, burned my fingers on the baby compressor, pinched my finger in the break thingy, and hit myself with the car door…but I got the stupid tires aired up. I ended up riding the bike maybe 20 minutes, realizing the squats had only been strengthening half of my legs and that for someone that doesn’t do cardio yet – it only takes about 5 minutes for exhaustion to set in. BUT – I learned something valuable. Being fit isn’t easy. As a person with no God given physical/athletic abilities, it’s more than hard…it’s like deciding I’m going to win a Grammy next year. It sort of looks like this impossible dream – some mirage way out in the distance. Being the grown woman I am though, I KNOW that’s a lie. It’s not impossible, it’s actually very doable. It’s unknown territory, and that’s ALL it is. I’m guessing the reward for being fit is basically immeasurable because very rarely do I face this much resistance in life over something that seems so small. Quite frankly, if it wasn’t going to be amazing on the other side, Satan would just let me do it and quit wasting his time harassing me. Little does he know, even with all the clumsiness and awkwardness of my fitness journey, I am far too curious to give up. I have a whole lifetime to keep trekking and figure out what’s on the other side of all this chub and lack of oxygen. lol BRING IT ON. Posted on April 5, 2013, in Personal and tagged fitness, healthy, weight loss. Bookmark the permalink. Leave a comment.